MF Paint Management, LLC proudly offers garage floor painting and garage floor coating in Greenville, New Hampshire. Whether looking for a creative garage floor style for your home or business, or a simple, durable garage floor coating application, MF Paint Management, LLC is ready and able to get the job done. MF Paint Management, LLC has experience with many types of garage floor coatings, paints, epoxies and systems. Our experienced painters are trained in proper application of garage floor coatings in Greenville and we take great pride in our work. When you are ready for installation of a garage floor system for a home or application of a garage floor coating in your Greenville business, MF Paint Management, LLC is ready for your call at (603) 556-7557! 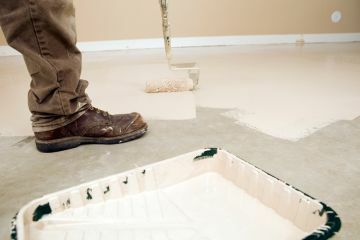 MF Paint Management, LLC is a leading provider of garage floor painting services. Our painting experts have over 28 years of residential and commercial painting experience and can help your garage floor stay looking great. Our process for painting garages in Greenville begins by carefully preparing the surface. The garage floor is swept, then thoroughly cleaned to remove dirt, oil and grease. Next we work on filling in all gaps, cracks or holes. Then MF Paint Management, LLC's painting professionals finish by applying the paint, coating, sealant, urethane or epoxy that has been selected for the job. The result is a shiny clean new garage floor! Serving Greenville's garage floor epoxy coating needs since 1991, MF Paint Management, LLC is skilled in local garage floor painting. Call (603) 556-7557 today and learn how we can help preserve and beautify your garage floor.